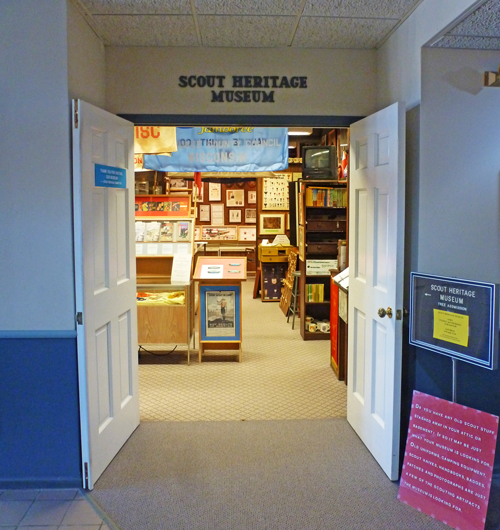 Three Harbors Council's Milwaukee office is the home of the Scout Heritage Museum. The museum was organized in July of 1975 with a mission to collect, repair, preserve, and prepare for exhibit Scouting items of historical value and interest. Today, the museum houses items from both Three Harbors legacy councils in one of the finest collections of historic Scouting memorabilia in the United States. Cub Scout Advancement and Boy Scout Merit Badges. The Scout Heritage Museum provides a number of opportunities for Cub Scouts to fulfill rank requirements. Cubs can learn about two Scouts who were astronauts. They can view collections of knives, axes and uniforms and games. A knot tying board displays most common knots including the bowline and square knot. Boy Scouts working on Collections or Scouting Heritage Merit Badges can view an extensive collection of Scouting items including handbooks, uniforms, patches and Jamboree flags. The display of Lord Baden-Powell, Gilwell Park and related items should be of special interest. Museum guides can share their own experiences as Scouts and adult leaders. or the Collections Merit Badges? The current display is a collection of historic camp patches from Indian Mound Scout Reservation. The Scout Heritage Museum invites you to the 40th Annual Trade-O-Ree, November 3, 2018 from 9:00 a.m. until 3:00 p.m. at the Milwaukee Scout Service Center, 330 South 84th Street, Milwaukee. This event makes a great field trip for packs and troops. See thousands of Scout memorabilia, artifacts and collector items. Admission is FREE! 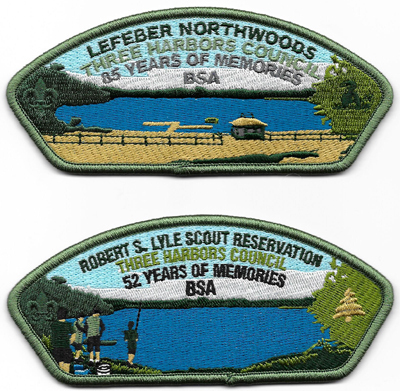 Beginning February 1, 2016, sets of the final LeFeber Northwoods Camps and Robert S. Lyle Scout Reservation patches will be available at the Kenosha and Milwaukee Scout Service Centers. The price for the two-patch set will be $10.00 with a limit of no more than three sets per person. The sale of these patches will benefit the Scout Heritage Museum. 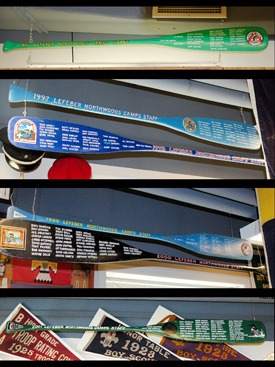 A new addition to the museum is a display of LeFeber Northwoods Camps Staff canoe paddles. Each paddle has the names of the staff for a particular year. These staffers helped generations of Scouts earn merit badges, experience nature and build lasting friendships all in the northwoods of Wisconsin. The paddles are hanging from the ceiling...You have to look up! The Scout Heritage Museum is managed and staffed by a group of dedicated volunteers who can provide you and your unit with a guided tour, as well as answer your questions if you just want to stop in for a few minutes during your visit to the Milwaukee Scout Service Center or the National Scout Shop. Posted museum hours are Noon - 4:00 p.m. Tuesday and Thursday and 9:30 a.m. - Noon on Saturday. The museum is closed on Saturdays from June through August. Since volunteers staff the museum it is best to call ahead. Please contact Marianne Fisher Monday-Friday between 8:15 a.m. and 4:30 p.m. at (414) 443-2870 or Marianne.Fisher@Scouting.org. Tours are free. If you have an interest and want to learn about joining the museum's volunteer team, please contact Marianne Fisher at (414) 443-2870 or Marianne.Fisher@Scouting.org.